Lawrence Hamnett encourages coaches to support specialized goalkeeper training and will offer, most seasons, weekly training sessions that encompass the economical coaching model. Sessions will utilize simple to complex progressions that reinforce both technique and tactics while pushing the physical component and staying positive to foster high self-confidence in the young keeper. Goalkeeper training is run by Paul Blodgett and Dave Pekarek, of the Paul Blodgett Goalkeeper Training School. The sessions are designed to be progressive, so it is highly recommended that players consistently attend the training to get the most benefit. There is no additional cost for currently registered competitive and development team players. Players shoud arrive 5-10 minutes early so the sessions start on time, ready and prepared for the activity that they will be participating in (i.e. 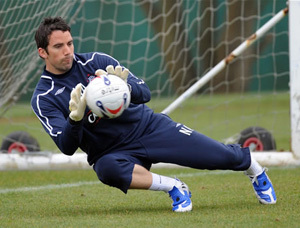 - wearing GK gloves and any other equipment they personally require for the activity). Lawrence Hamnett provides the following 8-week curriculum as a guide to coaches who wish to incorporate GK training into their season plans.